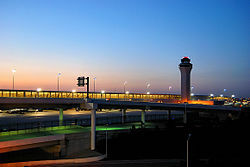 The Detroit Metropolitian Airport which occupies most of Romulus. Motto: "With Pride, With Unity"
My brother lives in this house. He likes it and the area fine. The neighbors are friendly. However, This property has a lot of ghost issues. We have tried to research what has gone on here but have come up with nothing. There are loud banging sounds every night, whispering, loud yelling, things dropping, cupboards slamming closed. normally the activity starts from 11pm to 9am. He has twin little girls that are 3. The little girls say there is a monster in the corner of their room. They say she is very mean and not pretty, very scarey. A lot of activity is in the girls room. My brother set up video cameras and has caught EVP's that tell his one daughter to kill the other one. Both little girls wake up screaming in the middle of the night out of nowhere. My brother moved the girls into his room to sleep because he is afraid to leave them in their room, well one night one woke up, then woke up my brother saying "he wants me to go back to my room daddy, I need to go back to my room, he wants me to right now." My brother asked "who? who wants you to go back to your room?" His daughter pointed to the ceiling and said "HIM! He said I need to go sleep in my room." This and many other things have happened here. He is in the process of getting video evidence. This is a new home, we can't figure out why all this is going on unless something happened on the property and just transferred to the home. Either way, it's not okay. I must say..some of the greatest people I've ever met in my life live at that address. Especally Kandie..she is just the smartest person I could have ever come across in my life...folks..trust me when I tell you this. She is the GREATEST!!! We know this property has been forclosed and we are trying to find out who owns it.